After attending a boarding school run by the disciples of Krishnamurti, an Indian guru, he studied painting at the School of the Museum of Fine Arts in Boston, then traveled to England, where he made his home. After an inspiring trip to Inverness, Scotland, Fassett began designing knitwear for Bill Gibb, and then the Missonis, Vogue magazine, and private clients like Lauren Bacall and Barbra Streisand, and, in the process, revolutionized the handknitting world with his explosive use of color. Further explorations led him to needlepoint, mosaics, rugmaking, tapestries, yarn and fabric design, costume and set design, and quilting. Now in his seventies, Fassett continues to produce new work and to travel worldwide to teach and lecture. In this intimate autobiography, Fassett shares rich, detailed stories about his lifelong creative journey as well as hundreds of glorious photos taken along the way. I read “Dreaming in Color” in two long sittings – it would’ve been one sitting but a girl has to sleep! Dreaming in Color It is terrific, extraordinarily inspiring, and I’m ready for the sequel! There are stories in this book that are pivotal – a terrifying climb during his high school days when terror froze him at a perilous height and he had to find his way to move forward. Losing a critical piece of knitting on the train just days before a deadline and having to stitch it all over again. This, not once but twice. When I say I am ready for a sequel I am being greedy – but the book leaves me wanting more. Couldn’t he scoop up the trimmings from this opus and fashion them into an addendum? Or simply pick up one stray end and carry it on into a deeper reflection? Well – consider this a rave. And I haven’t even mentioned the glorious illustrations that festoon the pages of this book – from ample (and large) images of his needleworks and paintings, to the family photos and tender line drawings and watercolor portraits of his extended family and friends. And it is with that easy grace that Kaffe brings mastery, individuality and authenticity to the page. And yes, he does reveal how he came by his name – how it is pronounced – and the long-kept secret identity of that infamous woman on the train who taught him how to knit. America’s landscape was transformed, both literally and figuratively, in the 1950s by a prosperous post-war middle class hungry for a glittering array of mass-produced consumer items for the home. In housing, mass production found expression in the suburbs, which became emblematic of uniformity as a positive social force. Sameness, it appears, was a good thing. Thankfully, Kaffe Fassett skipped all that. Had he not, Fassett may not have become one of the most important textile artists of his generation, a story he tells in a beautifully written and illustrated autobiography, Dreaming in Colour, about $30 on Indigo.ca and Amazon.ca…. How many men do you know who have taken up knitting, quilting, patchwork or needlepoint? American-born designer Kaffe Fassett is one such man, rarely to be seen without a ball of yarn and a pair of knitting needles. His passion for lively patterns and vivid colours is expressed in his unique knitwear and textile designs coveted by many around the world. Fassett’s autobiography, Dreaming in Colour, is as richly patterned and as vividly colourful as the textiles he designs. Fassett gives us an intimate and fascinating insight into his life and work, from his birth in San Francisco and his unconventional childhood in Big Sur, California to his work with weaving villages in India and Guatemala for the charity Oxfam. 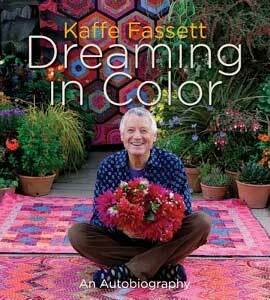 While some might say that an artist like Kaffe Fassett, a man who came into this world on the day the Japanese bombed Pearl Harbor would inherit darkness, if you knew anything of Fassett’s art, you would only consider that with him came the birth of light.